VIDEO GAMING PARTY BUS – HOW MUCH SPACE? Nothing! Just tell us the time and place where you would like us to be and thats it. All we need is access to a standard plug socket and away we go. From the moment we arrive we will take control of the party from start to finish, leaving you the luxury of a hassle/mess free party! WILL IT COST ME A FORTUNE IN ELECTRICITY? No, careful consideration has gone into our video gaming party bus kent design, meaning everything is LED and LCD which is very low consumption. In terms of usage we would be drawing less than a standard fridge when everything is turned on. HOW MANY PEOPLE CAN WE INVITE ? Inside our video gaming party bus we have installed stadium seating, giving a maximum capacity of 16 people. If you have a large party over this number, let us know in advance as we can arrange for a longer party, and split the group into two. The minimum age is 7 years old, there is no max age limit. We will only allow children to play games that are age-appropriate, and act in accordance with the current PEGI ratings classification. DO YOU PROVIDE FOOD? CAN WE EAT INSIDE? Unfortunately we are not able to have any food or drinks items inside of the van, therefore any ordered food would need to be eaten after the party takes place. CAN WE HAVE A COPY OF THE PICS YOU TAKE THROUGHOUT THE PARTY? Yes indeed! 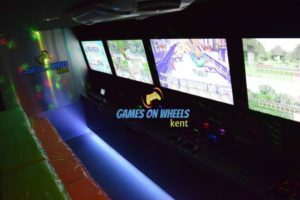 We place the pictures of each party on our Facebook page, just search “games on wheels kent” on Facebook. Please note, we retain the right to use some of the best pictures for marketing.